Finland made it to the final of the annual world ice hockey tournament. This tournament loses value in that it is held every year, including years when the Olympics are on and doesn’t feature the top players who are appearing in NHL finals. It would be the equivalent if holding the World Cup at the same time as the later stages of the champions league. Still the final last Sunday was an enjoyable occasion. 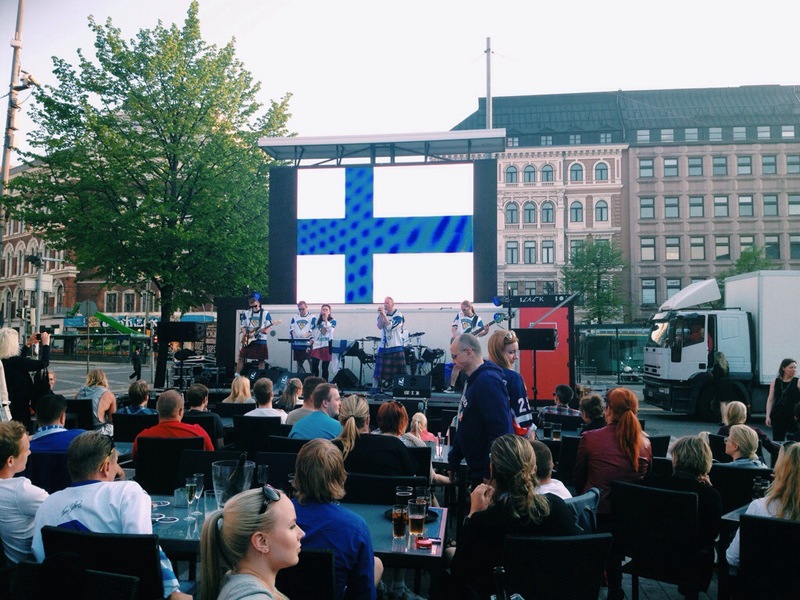 It seems that one Helsinki bar has worked out that a terrace + huge clear screen + rock band in Finland shirts and kilts is a winning formula. That bar was working all night and even outside the terrace, many bystanders watched the game with drinks purchased there. Would it be too much to expect the same experience during the World Cup?